Welcome to Honeysuckle Hollow where all the woodland creatures work together to take care of each other and the environment. This is Li’l Woodzeez and I was sent some products to review and they are Whooswhoos Owl Family comes with a family of 4 characters: father Owen, mother Delores and children Pete and Peep. "Nighty-Night-Sleep-Tight Lookout" storybook is about Delores and Owen, and their kids, Pete and Peep, can see all over town from their watchtower. It's important that everything's in order in Honeysuckle Hollow. One day, after cousin Keith slips on banana peels, they investigate and find a trail of peels that leads to a mystery. Bushtails Squirrel Family comes with a family of 4 characters: father Oliver, mother Maggie and children Henry and Honeybun. Also, a storybook called "Tickle-Your-Taste-Buds Bakers” which is about the Bushytails and they make the most scrumptious pies in town. Maggie and Oliver, along with their kids, Henry and Honeybun, pick and peel apples while Grandma Agnes gets the pie crusts ready. Then it's time to deliver their pies on a bicycle built for two. 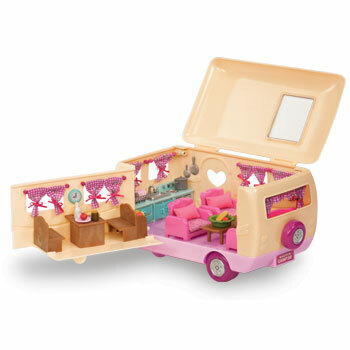 Happy Camper that comes with 1 car, 1 camper, 1 spare tire, 1 luggage, 1 table, 1 double size sofa bed, 2 armchairs convertible into single beds, 1 foldable sofa mat, 2 foldable armchair mats, 2 large cushions, 2 small cushions, 1 dish rack, 1 pot & 1 lid, 1 pan, 2 milk bottles, 1 large bowl, 4 large plates, 2 large cans, 1 small can, 1 honey jar, 1 peanut butter jar, 1 chocolate spread, 2 jam jars, 3 loaves of bread, 3 apples. (Characters shown sold separately) with a total of 40 pieces. My Opinion: These are fun toys to keep the kids busy this summer along with happy camper to show how fun it is to go camping and I love to go camping so this is a great idea. My nieces and nephews will enjoy playing with this for days to come. The families are so cute and made well almost real like.